My involvement in melt electrospinning began in 2003, as an Alexander Von Humboldt post-doc with Doris Klee and Martin Moeller at DWI, RWTH-Aachen, Germany. My challenge was to electrospin directly onto cells, where the problem is that the volatile solvents often required for solution electrospinning are toxic. To electrospin aqueous solutions, a strategy is needed so that the polymer solution doesn’t redissolve upon landing on the cells. Our initial strategy was to used macromolecular assembly to produce insoluble fibers. A student, Julia Llexia Calvet, and I were provided some low molecular weight PEG-PCL to produced aqueous micelle solutions. These micelle solutions were electrospun with the goal of rendering them permanently insoluble, however getting an effective Taylor cone was very challenging. One evening I was discussing with Dr Ahmed Mourran on the topic, and the melting point of PEG-PCL block copolymers was brought up regarding solubility. This discussion sparked my now decade-long interest in melt electrospinning as an approach for biomedical material fabrication. The first melt electrospinning experiments were very rudimentary, with sessile drop systems. Julia and I collected the electrostatically drawn filaments from five different PEG-block-PCL and looked at them under SEM. The samples were predominantly a mess with lots of large molten fibers splattered onto the collector (for example see Figure 3; reference 1). However in the corner of one sample were some high quality, solid fibers with nice low molecular weights…the next year was spent trying to determine the conditions necessary to get that particular type of fiber. Kristina Klinkhammer (Feil) played a large role in this respect – she started a 6 month project on this, working so hard and with long hours trying to optimize the fiber quality, and then melt electrospin onto cells. Since the PEG-block-PCL synthesized for us had a low molecular weight (these were intended for micelle formation), we blended the block copolymer with pure PCL – essentially creating a solution with the molten PEG-block-PCL as the “solvent”. We worked out the parameters required to get high quality fibers; low flow rates appeared to be key in this aspect. The transition from metal collectors to Petri dishes was difficult, and Kristina had to bore holes through the bottom of the Petri dish, place in a metal screw, then seal it up, culture cells. A month of intensive research showed that we could melt electrospin onto cells, without affecting their vitality . This was done on a limited budget, in a polymer chemistry institute (and with a lot of perseverance !!!). While Kristina went on to a different electrospinning project at DWI for her PhD, Dirk Grafahrend worked on a polymer synthesis project to functionalize electrospun fibers. He also worked a on melt electrospinning with different polymers including polypropylene – since I was leaving DWI we summarized all the little experiments into a “phenomenological” paper where we highlight some of the interesting observations made using melt electrospinning at DWI . I moved to Southampton, UK, in 2006 and worked with Hugh Perry on a Wellcome Trust Fellowship that involved performing a lot of experimental spinal cord surgeries in rodents. As someone with a materials science background I am now in awe at the amount of work that some biologists must do to publish in their field. Day in, day out, there were a lot of surgeries in windowless rooms, followed by sectioning tissue, immunohistochemistry, PCR, etc. In an effort to retain my sanity (! ), I built a melt electrospinning device by scavenging pieces from around the department. What started out as research had turned into a hobby! 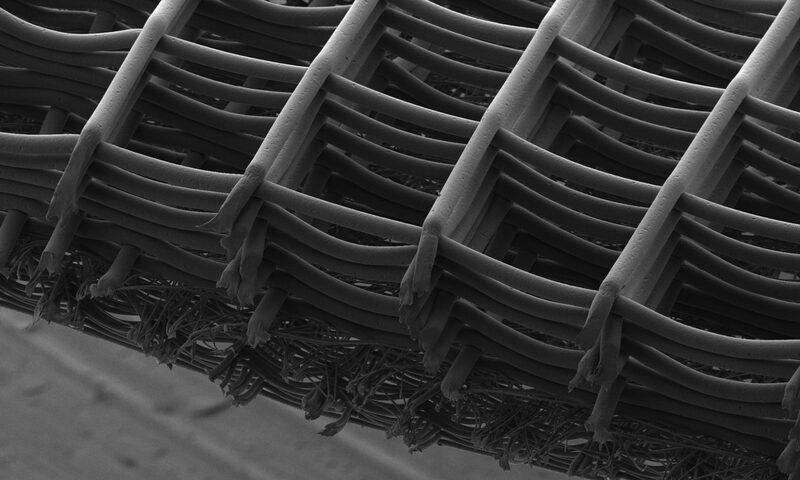 A Danish student, Nanna Joergenson, was visiting Southampton and we developed a six week project that looked at the focused deposition of melt electrospun fibers . This “predictable” deposition of polymer melts was fascinating, and I knew that one could “write” with them. When I met Dietmar Hutmacher at a conference in Prague we agreed to work together and develop this as a direct writing approach for regenerative medicine. At the time, my family was temporarily being relocated to Shanghai, so we agreed to establish melt electrospinning writing together solely at QUT. Christof Hacker was the first student to visit from Germany and he worked with Dietmar and Tim Dargaville in getting the first machine up and running in Australia. A great team of researchers in Nicola Detta, Fredrik Edin, Anthony Skelton and Toby Brown built on this and spent a lot of time first getting the process working and building the machines in a safe manner . Melt electrospinning has a higher level of difficulty to establish, compared to solution electrospinning. To achieve high quality fibers it is necessary to control specific parameters carefully when building these machines.After establishing melt electrospinning in the QUT laboratory, Toby Brown used a translating collector to create straight filaments and write the filaments accurately . With a faculty position available, I moved to the University of Würzburg, Germany, where time was taken to manufacture high quality printers, and there are currently five custom-built machines. The lab is growing and run by a small, enthusiastic team, making new structures and scaffolds using this process that we coined “melt electrospinning writing”, or MEW. Dalton PD, Calvet J-L, Mourran A, Klee D, Möller M (2006) Melt Electrospinning of poly(ethylene oxide-block-e-caprolactone). Biotechnol J, 1, 998-1006. Dalton PD, Klinkhammer K, Salber J, Klee D, Möller M (2006) Direct in vitro electrospinning with polymer melts. Biomacromol, 7,686-690. Dalton PD, Grafahrend D, Klinkhammer K, Klee D, Möller M (2007) Electrospinning of polymer melts: phenomenological observations. Polymer, 48, 6823-6833. Dalton PD, Jörgensen N, Groll J, Möller M (2008) Patterning of melt electrospun substrates for tissue engineering. Biomed Mater, 3, 034139. Detta N, Brown T, Edin FK, Albrecht K, Chiellini F, Chiellini E, Dalton PD, Hutmacher DW (2010) Melt electrospinning of poly(e-caprolactone) and its blends with poly(ethylene glycol). Polym Int,59, 1558-62.